PROBLEM REPORTED: For purpose of energy saving, company had Installed polypropylene clear sheets by replacing Some galvalum sheets from roof. These sheets were passing light as well as heat to the shop Floor thereby increasing shop floor heat and lux Level. PROPOSED SOLUTION: Application of UGAM P U with THERMAL INSULATION was proposed with lux reducing Compound. ACTION TAKEN: Entire Clear sheets were coated with proposed System. RESULTS ACHIEVED: Lux level was reduced to required level. Temperature was reduced by 4 degrees C. These coatings are being used by almost entire Tata Group e.g. TATA TOYO RADIATORS LTD., TATA JOHNSON LTD. Etc. brightness of the interior area. The reduction of brightness depends upon coating thickness and should be decided on sample application on case to case basis. 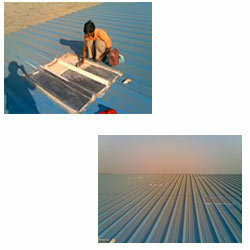 Similar application is done to the roof of m/s Tata Yazaki Autocomp Ltd. Kesnand. PROBLEM REPORTED: Heat leakages through top coat oven to be blocked and Energy saving to be achieved. PROPOSED SOLUTION: UGAM H R T I 600 SYSTEM to be applied to interior of oven tunnels for repelling I R radiations inside the oven. ACTION TAKEN: UGAM HRTI 600 SYSTEM applied to interior of side walls of Top Coat Oven. RESULTS ACHIEVED: We are proud to prove the savings beyond 5 % as Promised by us. Ugam heat resistant coating is used to the interior of Automobile Pre Treatment and ED coating oven. 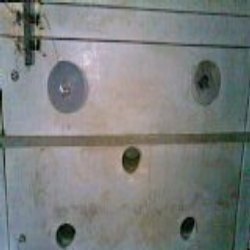 These ovens are prone for rusting and need to be protected. UGAM H R T I 600 is suitable solution for these ovens. These coatings are applied at M/S MAHINDRA AND MAHINDRA LTD NASHIK. With application of these coatings, the life of these ovens is increased and the paint defects are minimized. 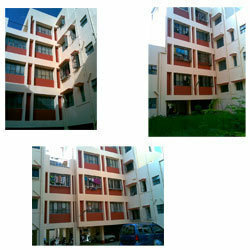 We offer maharashtra housing development authority BLDG. at morewadi, pimpri are coated with ugam insulmix systems for water proofing and thermal insulation purpose to stop water leakages from terece as well as side walls. PROBLEM REPORTED: LEAKAGES AND SEEPAGES ALL OVER FROM WALL. PROPOSED SOLUTION: APPLICATION OF UGAM INSULMIX SYSTEM. 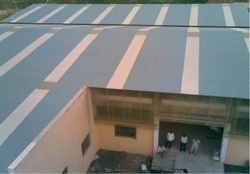 ACTION TAKEN: ENTIRE BUILDING WAS COATED WITH UGAM INSULMIX FROM EXTERIOR WITH DESIRED COLOR SHADE. RESULTS ACHIEVED: COATING WAS COMPELTED IN 2006 AND TILL DATE THERE IS NO COMPLAINT ABOUT ANY LEAKAGE OR SEEPAGE FROM ANY OF THE BUILDING. LPG Tanks and Pipe Lines were coated with UGAM LPG Bullets coating systems to protect tanks from overheating due to sunlight in summer and prevent condensation to increase the life of bullets as well as saving the energy used by vaporizer. Estimated energy saving achieved by them is Rs. 25 Lacs, 5 Years after covering the cost of projects. PROBLEM REPORTED: Enamel paint coated to LPG bullets, forms flakes and needed Recoating every year. The temp of bullet top surface used to Cross 50deg C in summer and needed cooling through sprinklers every day thereby increasing energy and resources costs. 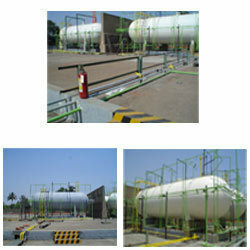 PROPOSED SOLUTION: Coating LPG bullets with UGAM INSULMIX COATING SYSTEM FOR LPG BULLETS. 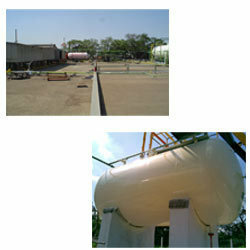 ACTION TAKEN: LPG BULLET & PIPES WAS COATED WITH UGAM INSULMIX WITH WHITE COLOR. RESULTS ACHIEVED: COATING WAS COMPELTED IN 15 May 2006 AND TILL DATE THERE IS NO COMPLAINT. Our project WIT Girls Hostel. WALCHAND INSTITUTE OF TECHNOLOGY, SOLAPUR completed on 2007.The entire paint for interior as well as exterior were supplied by us. Project completed LPG Tank Coating. LPG Tanks and Pipe Lines were coated with UGAM LPG Bullets coating systems to protect tanks from over heating due to sunlight in summer and prevent condensation to increase the life of bullets as well as saving the energy used by vaporizer.